An Icelandic volcano, dormant for 200 years, has erupted, ripping a 1km-long fissure in a field of ice. 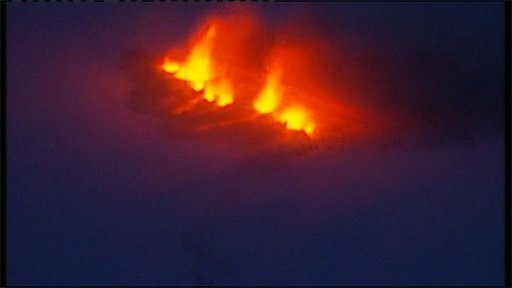 The volcano near Eyjafjallajoekull glacier began to erupt just after midnight, sending lava a hundred metres high. Icelandic airspace has been closed, flights diverted and roads closed. The eruption was about 120km (75 miles) east of the capital, Reykjavik. About 500 people were moved from the area, a civil protection officer said. "We estimate that no-one is in danger in the area, but we have started an evacuation plan and between 500 and 600 people are being evacuated," Sigurgeir Gudmundsson of the Icelandic civil protections department told the Agence France-Presse news agency. The area is sparsely populated, but the knock-on effects from the eruption have been considerable. A state of emergency is in force in southern Iceland and transport connections have been severely disrupted, including the main east-west road. "Ash has already begun to fall in Fljotshlid and people in the surrounding area have reported seeing bright lights emanating from the glacier," RUV public radio said on its website. "It was a bit scary, but still amazing to see," Katrin Moller Eiriksdottir, who lives in Fljotshlid, told the BBC News website. "The ash had started falling and we couldn't leave the car." Three Icelandair flights, bound for Reykjavik from the United States, were ordered to return to Boston, RUV radio reported. Domestic flights were suspended indefinitely, but some international flights were scheduled to depart on Sunday. There had initially been fears that the volcano could cause flooding, as it causes ice to melt on the glacier above it, but that scenario appears to have been avoided. However, it could cause more activity nearby, scientists say. "This was a rather small and peaceful eruption but we are concerned that it could trigger an eruption at the nearby Katla volcano, a vicious volcano that could cause both local and global damage," said Pall Einarsson, a geophysicist at the University of Iceland's Institute of Earth Science, Associated Press news agency reported. As the eruption is taking place in an area that is relatively ice free, there is little chance of a destructive glacier burst like the one that washed away part of the east-west highway four years ago, after an eruption under the vast Vattnajoekull glacier. Iceland lies on the Mid-Atlantic Ridge, the highly volatile boundary between the Eurasian and North American continental plates, with quakes and eruptions. The last volcanic eruption in the Eyjafjallajoekull area occurred in 1821.